Vox produced five generations of Tonelab multi effects processors for guitar between 2003 and 2012. Each was equipped with the 12AX7 powered Valvetronix Valve Reactor circuit plus a plethora of amp models, effects and programs. The retail prices ranged from $350 to $750. 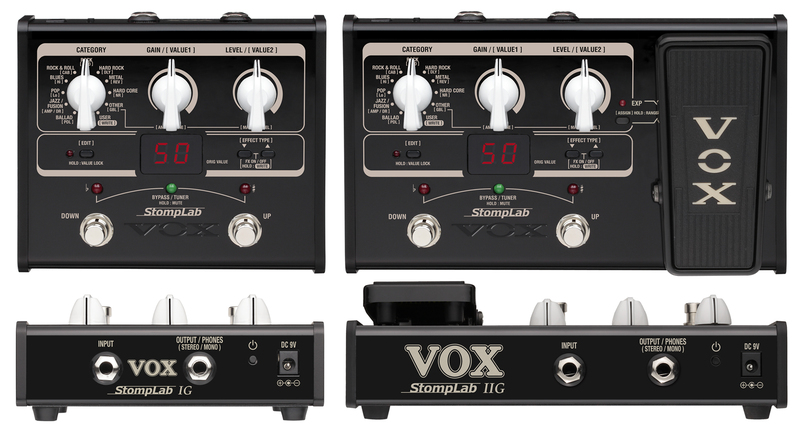 In 2012, Vox replaced the fourth and fifth generation TonelabST and Tonelab EX with the Stomplab IG and Stomplab IIG multi effects processors. While the Stomplab processors did not include the 12AX7 Valvetronix Valve Reactor circuit found in previous Tonelabs, the Stomplab IG and IIG still included 44 amp models, 104 effects and 120 programs. The Stomplab IIG even included an expression pedal. The Stompab IG retailed for just $89.99 while the Stomplab IIG was $116.99. Stomplab IG - ~5.7" x ~4.9" x 2.24" - 1.3 lbs. Stomplab IIG - ~8.15" x ~4.9" x 2.5" - 1.72 lbs.